My sewing mojo has been pretty much non-existent since I got back from Chicago in mid January. I have been really busy catching up with family and friends and to be honest I haven't made sewing a priority. All of the busyness has meant that I came down with a nasty cough and cold. I don't know about you guys, but I really can't sew when I am feeling under the weather. That said, cabin fever struck and I decided to finish my first ever cross stitch project! I actually finished the cross stitching towards the end of the summer, but it has been languishing in my sewing basket waiting for me to sew on the backing. I learnt cross stitch when I was tiny and in Primary school and hadn't really thought about it since. However, when I joined my sewing group a couple of years ago I saw some great designs and I thought about having a simple project to keep my fingers busy when I couldn't take any of my sewing projects along to meetups. I didn't find this project too difficult (although I did make some mistakes due to miscounting). I would recommend it for those wanting to start with a quick project. I found the instructions useful and the pattern interesting enough to keep me motivated. I am really happy with the overall look and I keep giving myself a high five for finishing it. Here is how the finished project is advertised online. Mine is a bit scruffier and needs a good press, but overall I would consider it a success. 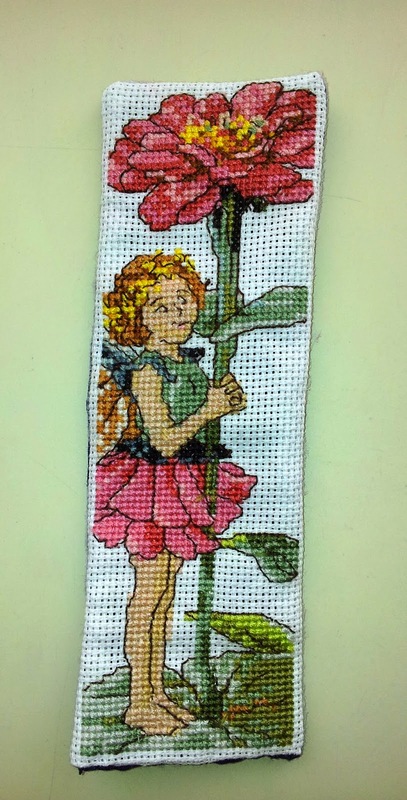 This project gave me the motivation to carry on and I have another cross stitch on the go. Will definitely be a good few months until it is finished, but nice to have another hobby that requires less thinking and concentration than sewing. In the meantime, fingers crossed that my sewing mojo returns (and my chesty cough and cold departs) so that I can start/finish my February garment of the month! Has anyone else seen a slump in their sewing mojo? It's so cute! I actually prefer your fairy's all-knowing smirk over the 'look am so adorable' one in the original. Much cooler :) And yes, my sewing has really taken a turn for the worse, I haven't done much on Fabulising February at all... Hope you feel better soon! You did a great job! Thanks for sharing it with us.